Metabolically inactive insulin: friend or foe in the prevention of autoimmune diabetes? About 20 years ago an American study suggested that daily subcutaneous injections of a metabolically inactive insulin analogue with a single amino acid substitution (aspartic acid instead of phenylalanine) at position 25 of the B chain was as effective as intact insulin in preventing autoimmune diabetes in NOD mice. 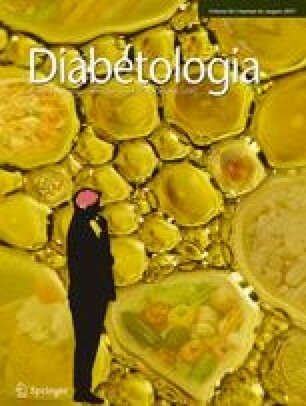 In this issue of Diabetologia Grönholm et al (DOI: 10.1007/s00125-017-4276-5) report that parenteral administration of the same insulin analogue has no preventive effect whatsoever on the development of diabetes in NOD mice; in fact, high doses of the metabolically inactive insulin accelerated disease development. The authors were also unable to show any tolerogenic effect of an insulin peptide mimetope given via a subcutaneous osmotic pump. These data do not support the use of metabolically inactive insulin for the prevention of autoimmune diabetes and question whether insulin alone, intact or inactivated has any role in preventing progression to symptomatic diabetes. Future and ongoing intervention trials in humans with preclinical type 1 diabetes should indicate whether the administration of oral insulin has any protective, neutral or even predisposing effects on the development of symptomatic diabetes. Insulin has been perceived as the primary autoantigen in autoimmune diabetes both in humans  and in NOD mice . Consequently insulin has been used widely in studies applying antigen-specific therapy for the prevention of type 1 diabetes. Earlier studies have shown that oral, nasal and subcutaneous administration of insulin to prediabetic NOD mice protects to a variable degree against progression to clinical disease . However, studies in humans have, so far, been unable to show any protective effect of insulin against the development of type 1 diabetes even when using different routes of administration. The only exception is the post hoc subgroup analysis in the oral arm of the Diabetes Prevention Trial (DPT-1) that showed a delayed progression to clinical disease among the participants with high insulin autoantibody (IAA) titres . The contrast between NOD mice and humans in the success of preventive interventions implies that there are fundamental differences in the disease process leading to autoimmune diabetes in mice and type 1 diabetes in humans . Recent studies have suggested that type 1 diabetes is a heterogeneous disease in terms of which autoantibody appears first [6, 7]. IAAs are the first autoantibodies in more than half of prospectively observed children with HLA-conferred disease susceptibility, turning subsequently positive for multiple (more than two) autoantibodies, while close to 40% present with GAD antibodies as their first autoantibodies. Islet antigen 2 and zinc transporter 8 antibodies are rarely the first autoantibody reactivity to emerge. The observed heterogeneity raises the issue of whether there are different primary autoantigens in humans and whether the autoantibodies emerging first are markers of such a difference. If so, that difference should be taken into account when planning antigen-specific immunotherapy in preclinical type 1 diabetes. In autoimmune diabetes in NOD mice the role of insulin as the primary autoantigen appears to be more robust, although other autoantigens, such as islet-specific glucose-6-phosphatase catalytic subunit-related protein (IGRP), have been identified . In 1995, Muir et al reported that immunisation with insulin or the metabolically inactive B chain in prediabetic NOD mice converts a destructive insulitis into a protective one by inhibiting the expression of Ifng mRNA (encoding IFNγ) in the insulitis lesions . Two years later Karounos et al observed that daily s.c. injections of a metabolically inactive insulin analogue (MII) with a single amino acid substitution (aspartic acid instead of phenylalanine) at position 25 of the B chain was as effective as intact insulin in preventing autoimmune diabetes in NOD mice . The protective effect was seen in young adult mice even when the treatment was started after the appearance of extensive lymphocyte infiltration into the pancreatic islets. These observations indicated that the protective therapy did not require a hypoglycaemic response or binding to the insulin receptor to be effective. Grönholm and collaborators used a similar MII in their study published in this issue of Diabetologia . They treated non-diabetic 8-week-old female NOD mice with s.c. MII injections at constant doses of 2 μg, 20 μg or 200 μg twice weekly for 5 weeks. In addition one group of mice was treated with a ramp up dose from 2 μg to 200 μg over the 5 week period. The authors did not observe any delay or protection from autoimmune diabetes but, in contrast, the higher doses of 20 μg or 200 μg accelerated disease development. Since Karounos et al had given the MII daily, 5 μg was administered daily to a group of seven mice in the current study, but no preventive effect could be seen. The authors also tested whether any protective effect could be induced by administering the insulin peptide mimetope 3, which has previously been shown to prevent autoimmune diabetes . No tolerogenic induction could be observed, however. The authors set out to assess whether high i.v. doses of MII could induce tolerance. For this purpose 7-week-old NOD mice were injected intravenously with 400 μg MII or PBS twice weekly. Diabetes appeared slightly earlier in those mice treated with the MII. In one group of mice CD8+ T cells were stained with tetramers for insulin and IGRP at 16 weeks at age. No differences were observed between the MII-treated mice and the control mice in the number of tetramer-reactive CD8+ cells in the pancreas, pancreatic draining lymph nodes or the spleen. In addition the authors tested the impact of different dosing schemes for the i.v. injections (twice a day or every other day) but no protective effects could be observed. The i.v. treatment at high doses resulted in an increased number of insulin-reactive CD4+ T cells in the peripheral lymphoid tissue. Further, the authors analysed the outcome of i.v. administration of MII in 7-week-old NOD mice treated with parenteral anti-programmed death-ligand 1 (PD-L1) to investigate whether MII is capable of preventing anti-PD-L1-induced diabetes in NOD mice given that anti-PD-L1 can accelerate the development of autoimmune diabetes . The combination of anti-PD-L1 and MII turned out to accelerate the progression of autoimmune diabetes. The study by Grönholm et al was well planned and the methods applied were appropriate. Different doses of MII as well as different administration routes were assessed. As the authors had access to mice colonies at three sites, some tests were carried out in two different NOD colonies, with identical outcomes. The authors also provided data on the statistical power of their study. A major limitation of the study is the limited immune-phenotyping data available. FACS and functional analyses of regulatory T cells and effector T cell subsets could provide important information on treatment mechanisms. Initiation of therapy at an earlier age should be assessed, since the timing of therapy might change the outcome. Why do the outcomes of the current study differ from previous studies? The current study showed that parenteral administration of MII was unable to induce in vivo tolerance and to protect against progression to autoimmune diabetes in NOD mice. In fact, high doses of MII accelerated disease progression. These observations are in contrast with previous studies reporting that daily parenteral administration of intact insulin or an MII prevents insulitis and diabetes in NOD mice. There are some differences between the current study, with a negative outcome of MII treatment, and the study by Karounos et al , which reported a protective effect of MII. The amino acid in position B30 (alanine) was removed from the analogue used in the current study but was present in the analogue tested by Karounos et al. This amino acid has been observed to eliminate the induction of oral tolerance in NOD mice . Therefore, one would expect that its removal would strengthen rather than reduce the preventive effect of the analogue. There was also a difference in the diluents used between the two studies. Karounos and collaborators used m-cresol, phenol, glycerine and sodium phosphate diluted in water, while Grönholm et al used PBS. One cannot exclude the possibility that the diluent might affect the therapeutic efficacy of the analogue, although it seems unlikely. The current study used a dosing scheme with injections twice weekly, whereas the earlier study administered MII daily. However, Grönholm et al also measured the effect of daily MII administration without any change in the negative outcome. Therefore, there is no definitive explanation for the contrasting outcomes of the two studies. The study by Grönholm and collaborators indicates that parenteral administration of an MII does not provide any protective effect in terms of progression to autoimmune diabetes in NOD mice. Previous studies have indicated that repeated doses of insulin administered by oral, nasal or parenteral routes can prevent diabetes in NOD mice. The current study does not contradict those observations, but the outcome is in contrast with the results of previous studies testing the preventive effect of MIIs or the insulin B chain, which also lacks hormonal effects. The reasons underlying the conflicting results remain open for the time being. Thus far, the translation of the protective effects of insulin in NOD mice to humans with type 1 diabetes has not come to light. This reflects the fact that the prevention of type 1 diabetes is definitely more challenging than the prevention of autoimmune diabetes in NOD mice. The next piece of the jigsaw regarding the effect of oral administration of insulin to autoantibody-positive relatives of individuals with type 1 diabetes will be uncovered when the results of the oral insulin trial within TrialNet (ClinicalTrials.gov NCT00419562) become available. The author is supported by JDRF, Academy of Finland (Centre of Excellence in Molecular Systems Immunology and Physiology Research 2012–2017, Decision No. 250114), Special Research Funds for Helsinki University Hospital and Sigrid Jusélius Foundation.